Meet our board of directors behind our all volunteer-managed, patient-centered, nonprofit, Myositis Support and Understanding (MSU). 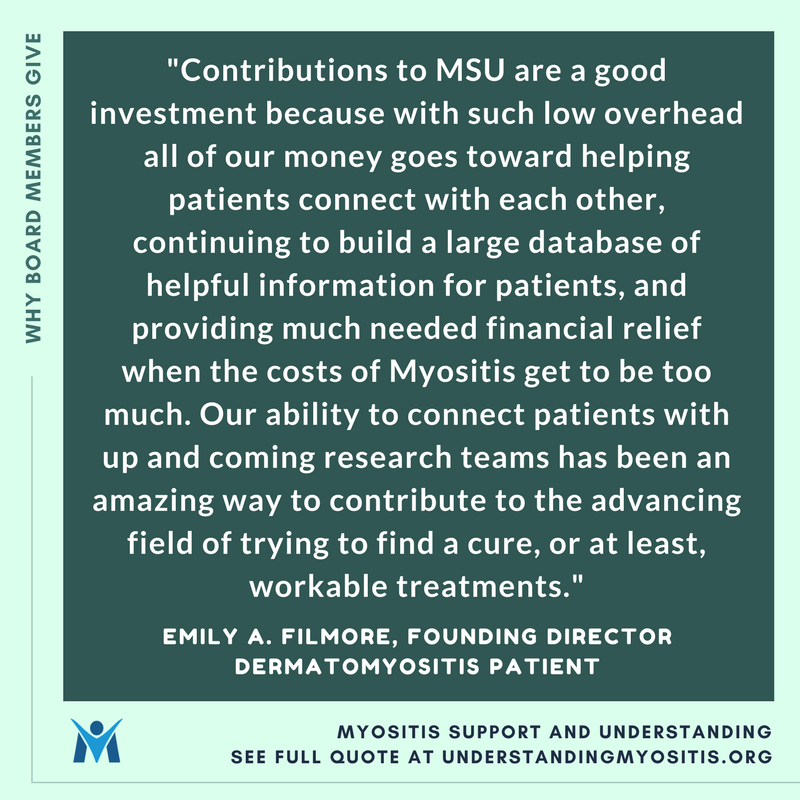 Gerald “Jerry” Williams, diagnosed with Polymyositis in 2003, founded MSU originally as a Facebook support group titled, “Polymyowhat: Understanding Myositis,” in 2010. Jerry is the Founder and President of MSU and also serves as the Executive Director. He is passionate about helping others living with this rare disease. 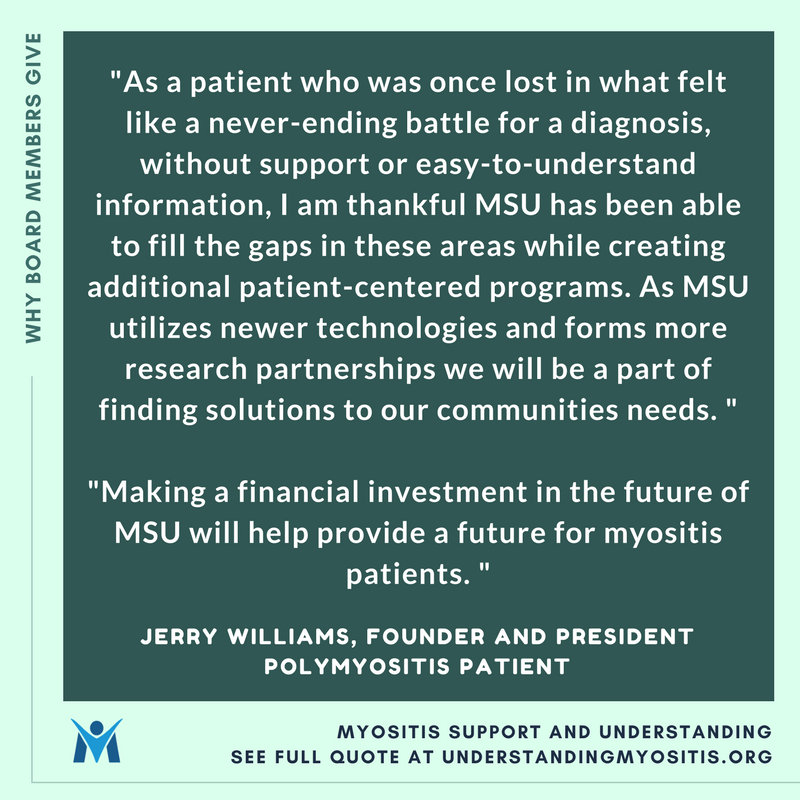 Gerald “Jerry” Williams, diagnosed with Polymyositis in 2003, founded MSU originally as a Facebook support group titled, “Polymyowhat: Understanding Myositis,” in 2010. Jerry is the Founder and President of MSU and also serves as the Executive Director. He is passionate about helping others living with this rare disease. Myositis forced Jerry out of the workplace, where his focus was in finance and analytics, and onto long-term disability. He has since been diagnosed with two additional autoimmune diseases, vasculitis, and Lupus, and finding effective treatments has been a constant challenge. Through the many health and life challenges Jerry has faced, he has come to believe that we all must be “understanding” and be willing to learn more about each other so that we can live a more positive life. One of his many loves are smiles, and he often reminds those around him to smile and happiness will follow. Jerry is married to his partner Charlie of 16 years and they are the proud fathers of three Dachshunds. 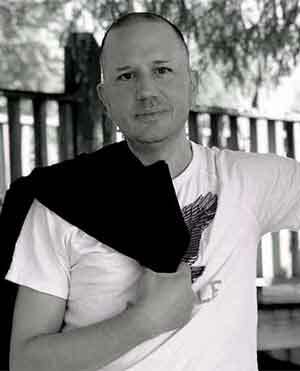 Jerry enjoys reading, writing, and website design and development. Jerry and Charlie also operate a small business with a concentration on website design, graphic design, and computer services, located in Lincoln, Delaware. Why does Jerry give to MSU? “As a patient who was once lost in what felt like a never-ending battle for a diagnosis, without support or easy-to-understand information, I am thankful MSU has been able to fill the gaps in these areas while creating additional patient-centered programs. We are just getting started. As MSU utilizes newer technologies and forms more research partnerships we will be a part of finding solutions to our communities needs. As president of MSU, I am proud to donate the little I can afford financially knowing firsthand that my small contribution directly impacts patients in positive, life-changing ways. My hope is you will join me in giving what you are able so we can continue to build upon our goals and actively participate in the global conversation surrounding myositis. Lynn comes to the Board with 38 years experience in the petroleum industry working as a petroleum engineer focusing on oil field research, operations training, project management and organizational change. Her career has taken her all over the world, flying over 1.5 million miles to 6 continents, including a year assignment in Hong Kong. 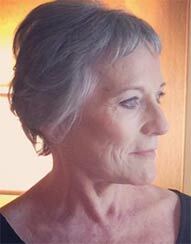 Having been diagnosed with Dermatomyositis in May 2015 at age 69, Lynn has experienced the ups and downs of this disease – from remission 5 months after starting treatment to an acute flare in 2016 that rendered her so weak she could hardly walk. She spent 7 months in physical therapy after severe muscle loss, but is now back in remission and running short distances and doing aerobics. Lynn has an appreciation of the uncertainties of this life-changing disease and respect for all of the myositis warriors out there who approach each day with grace and courage. Her motto for living “Seize the Day” has taken on new meaning with her diagnosis. 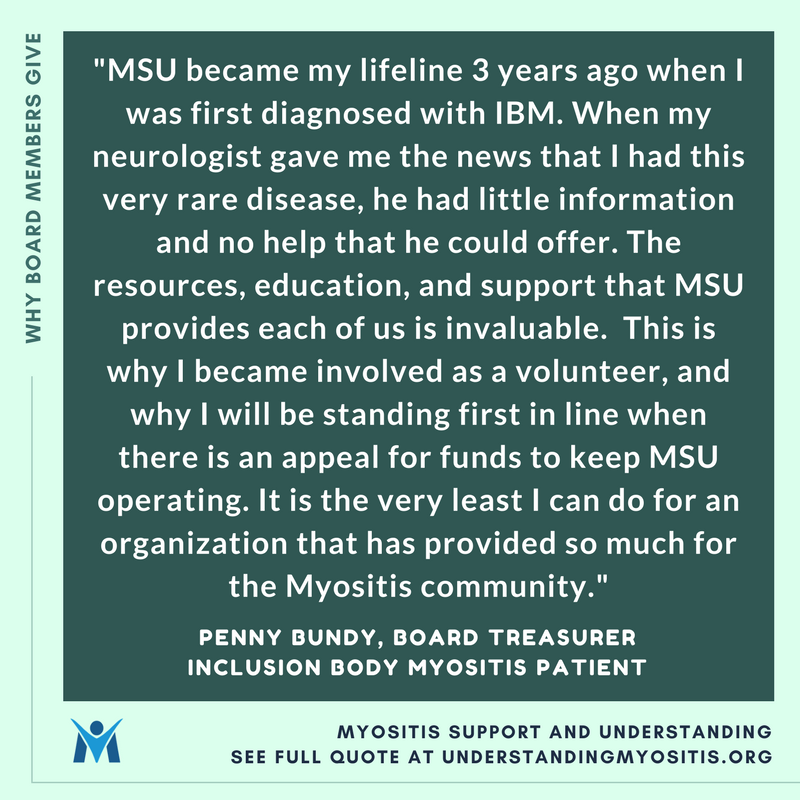 Lynn has worked as an Administrator for our MSU support group for almost 2 years, which has given her valuable insight into the issues of our myositis patients. 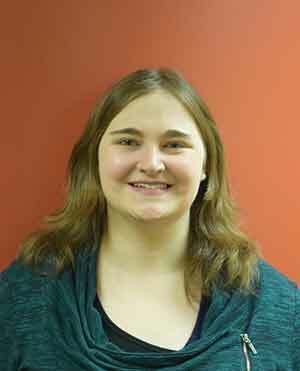 She is hoping to apply her skills to help build MSU into the premier patient-run myositis association in the country. Lynn lives in a small community south of Houston, Texas, where her husband Jon is the mayor. She continues to spend her retirement traveling with her husband to far off countries. She also travels coast to coast visiting her daughter in Napa, California, and her 4 grandkids in Middletown Springs, Vermont, where she has recently purchased a 1890 Victorian farmhouse. Penny Bundy was diagnosed with Inclusion Body Myositis in 2015, after 7 years of experiencing symptoms of the disease with no clear diagnosis. In researching the disease, she found and joined an online MSU support group. It was because of Penny’s positive experience with this group that she was excited about joining the MSU team. When Penny’s two children were both in school, she enrolled in the local community college intending to take a few basic business courses with the goal of starting a freelance photography business. Thanks to an encouraging accounting instructor, she was soon sidetracked from that goal and went on to pursue an accounting degree at university. 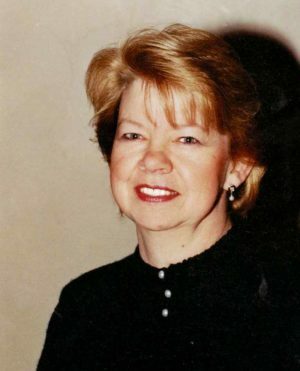 Penny’s work background has been varied, from volunteer bookkeeping positions for church, school and community theater, to Staff Accountant for a multi-service healthcare system which employed 5000. In 2001, Penny and her husband John took an early retirement. They sold their home, purchased a fifth wheel and became full-time RVers. During their time on the road, they continued to work, at one time helping open a new Indian casino where John trained the card dealers and Penny helped in establishing the slot audit and accounting department. In early 2014 Penny and John retired from the road as Penny’s mobility was becoming impaired and getting in and out of the RV was becoming more difficult. They purchased a small home on two acres that they share with their 16-year-old cat, Ralph. Why does Penny give to MSU? More information about Julie Posey is coming soon. 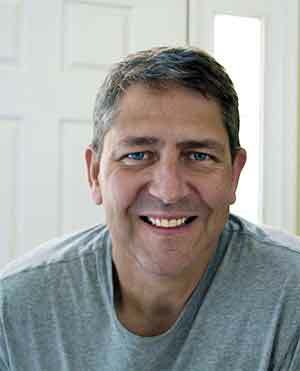 James “Jim” Doiron was diagnosed with Necrotizing Autoimmune Myopathy (NAM) associated with the Anti-SRP antibody in 2017. In less than two months, he went from a do-it-yourself master bathroom remodeling project to being unable to lift his 4-year-old grand niece. In June 2018, Jim learned that he has steroid-induced cataracts. James “Jim” Doiron was diagnosed with Necrotizing Autoimmune Myopathy (NAM) associated with the Anti-SRP antibody in 2017. In less than two months, he went from a do-it-yourself master bathroom remodeling project to being unable to lift his 4 year old grand niece. In June 2018, Jim learned that he has steroid-induced cataracts. Jim began professional life in the US Army and was trained as a fluent Russian linguist in Monterey, California. Eventually, he was stationed in Bavaria, Germany, where he met lifelong friends and his future wife. He continued his career in international training, first arranging exchange training programs in hospitality with clients such as Epcot Center at Disney World and the finest French restaurants in New York City. Then, he was part of a team that developed a 6-month long residency training program in Virginia for the Royal Saudi Navy. Then, his career moved into technology, earning a masters in Information Systems Technology and managing complex software development projects. Always surrounded by top-notch technical experts, Jim focused on the more complex (and interesting) people and organizational challenges found in these projects, ultimately earning a doctoral degree in Human and Organizational Learning. Jim views the world through a learning lens and, when diagnosed, was determined to learn all he could about his disease, which brought him to MSU. As part of the MSU team, Jim hopes to help others learn, learn from others, and continue to build a community of support and understanding. Jim is a native of Maine and lives in Virginia. His family provides strength. He has been married to his wife, Julie, for 26 years, and they are extremely proud of their son and two daughters. 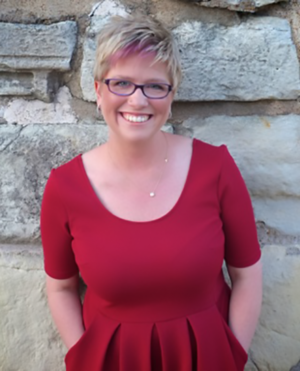 Caitlin Ray is currently PhD Candidate at the University of Louisville Rhetoric and Composition program, where she also teaches writing and communications in the English department, the Health Sciences Campus, and the College of Business. She graduated with a BA in English and Theatre from Hamline University in St. Paul, MN, and worked as an actor in the Twin Cities for several years. When she was 22 years old, she was diagnosed with dermatomyositis. Caitlin Ray is currently PhD Candidate at the University of Louisville Rhetoric and Composition program, where she also teaches writing and communications in the English department, the Health Sciences Campus, and the College of Business. She graduated with a BA in English and Theatre from Hamline University in St. Paul, MN, and worked as an actor in the Twin Cities for several years. When she was 22 years old, she was diagnosed with dermatomyositis. After moving back to her hometown, she began an MA in English from the University of Nebraska at Omaha, graduating in 2015. Her current doctoral research includes disability theory and medical rhetoric, which is informed by her dermatomyositis diagnosis. She is currently working on her dissertation on the rhetorics of rare illness, which examines the ways that rare illnesses are discussed in popular culture (including television shows and memoirs) and within rare illness communities. Caitlin is also a published poet and author, with work included in the The Untidy Season: An Anthology of Nebraska Women Poets, The Pedagogy and Theatre of the Oppressed Journal, Kairos: A Journal of Rhetoric, Technology, and Pedagogy, and the forthcoming book Making Future Matters. She also served as a Rare Disease Legislative Advocate in February 2018. In her spare time she enjoys reading, watching entirely too much TV, and crocheting. Follow her at @ray_raycaitlin for musings on disability activism, higher education, and dog retweets. Emily holds a BA in Psychology from Westminster College in Fulton, MO and a Juris Doctor from St. Louis University School of Law, but her career path has been as winding and unpredictable as the Juvenile Dermatomyositis that has gripped her body for 20 years. Combining humor and spirituality, Emily has found a way to make peace with her chronic disease, even celebrating it, grateful for the lessons and blessings it has brought into her life. Emily has found her passion in using her creativity to help others. Her inspirational book, “The Marvelous Transformation: Living Well with Autoimmune Disease,” is being released in June, 2015. She also writes on the combined topics of spirituality and parenting. She has written the With My Child series of children’s books about family bonding and is involved in the Conversations with God for Parents program by Neale Donald Walsch. She has a new book, by the same name (“Conversations with God for Parents”) being released in Fall 2015 co-authored with Neale Donald Walsch and Laurie Lankins Farley. Emily shares a beautiful life with her husband, daughter, and nephew. They collaborate to create a humorous and harmonious home of wellness, partnership, love, and peace. Why does Emily give to MSU? 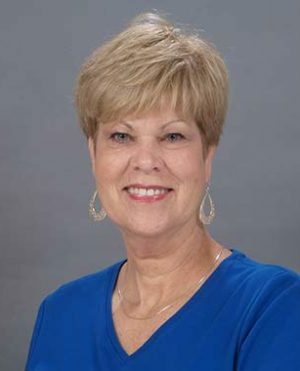 Sandy is a founding member of MSU, former Board Vice President and senior administrator of the MSU groups and public information page. Her interest and background in research and writing and as her parents’ healthcare advocate have helped her through her cope with PM and treatment-related issues. She is passionate about helping others become knowledgeable about their health issues and empowered to become their own healthcare advocate. Sandy left the corporate world in 2008 to become full-time caregiver to her parents for the last years of their lives. Prior to that she worked in the printing, paper, facilities and multifamily housing industries in conference and project management capacities and as a contractor with US Environmental Protection Agency, where she researched and wrote about manufacturing products using recycled materials. She has also been an active volunteer with several organizations. Sandy has called California, Virginia, Louisiana, Florida, and North Carolina home, and she and her Texas-born husband, Andy, currently live in the Raleigh area. 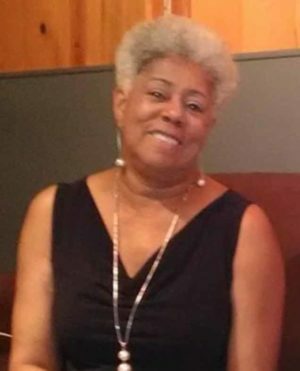 Her two children, three grandchildren and three stepsons live in North Carolina, Oregon, Washington and England, providing lots of travel opportunities. Sandy continues to be involved with MSU behind the scenes focusing on education, research, writing and patient empowerment.